Create custom labels with the Epson LabelWorks Standard LK Tape Gold on Brown Cartridge. With a width of a half an inch and nearly 16-feet of length, the cartridge features a split-back design, which makes it easy to peel and the durable, hard plastic casing allows for safe storage. 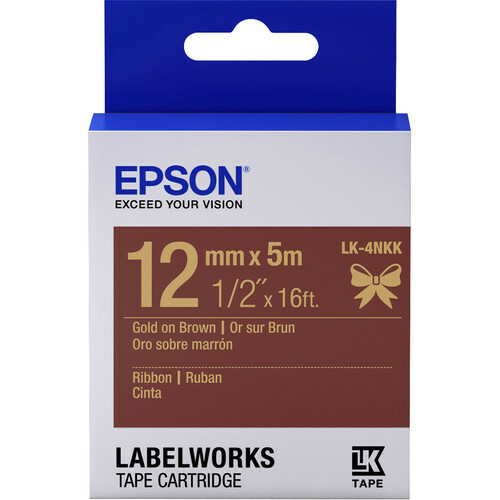 The cartridge is designed to work with Epson's LabelWorks label printers. It is recommended that you set the low-speed printing mode (if available) on your Epson LabelWorks label printer. Do not use the Auto-cut, Half-cut, or Auto-trimmer modes. Instead, use scissors to cut the fabric tape for a cleaner result.